Where to Buy: Rare Tea Co. Winner of a gold star in the 2008 Great Taste Awards. 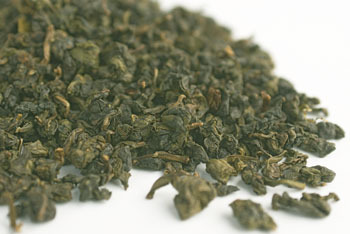 Rare Tea Oolong is known as the Goddess of Mercy or Tie Guan Yin. It is a lightly oxidised yellow gold. We have specially selected this oolong for its truly extraordinary flavour. Crafted to an exact point at which the leaves reveal their hidden subtleties it has rich floral aromas leading to a perfectly balanced mineral finish. The second infusion is richer and even more complex than the first. The tea can be infused several times to reveal incredible subtleties of flavour. Note: Read more about this Oolong here. Oolong tea has been a long-time favorite of mine. My affection for Oolong began with a delightful Fancy Formosa Oolong, and has since grown as I experienced the different varieties of Oolong. This is one of the very BEST Oolong teas I’ve ever tasted. The flavor is simply magnificent. The beautiful golden liquor is rich tasting, with notes of fruit and flower. It has a creamy buttery essence is so deliciously decadent. A smooth, silky sensation glides over the palate. It’s absolutely devine! It is also an extraordinary value (as are many high quality Oolongs such as this one) because one measurement of leaves can be infused multiple times – for many cups of enjoyment. In fact, it would seem almost criminal to NOT steep these leaves at least three or four times, as the subsequent infusions produce a tea that is even more flavorful than the first! This lovely tea is self-drinking – that is to say that it needs no additions to enjoy it. No milk or sweetener – these might just ruin an otherwise perfect cup of tea! And while it would be quite delicious served iced, to get the most flavor from it, it really should be enjoyed hot. This tea is truly delightful – a definite MUST TRY!